A few weeks ago when I posted this All-Natural Appletini recipe, I was in the thick of gearing up for a Meeting Professional International (MPI) – Carolinas Chapter Annual Business Exchange. I’ve been a member for more than three years as hospitality professional in the Raleigh-Durham area. This year, I was voted onto our Board as the Director of Special Events. Along with my committee, I put a ton of time and effort into planning our one-day trade show/business exchange. It’s a relatively small event compared to many others, but going through the planning steps reminded me of an important lesson: How to get attendees to return to your next event. 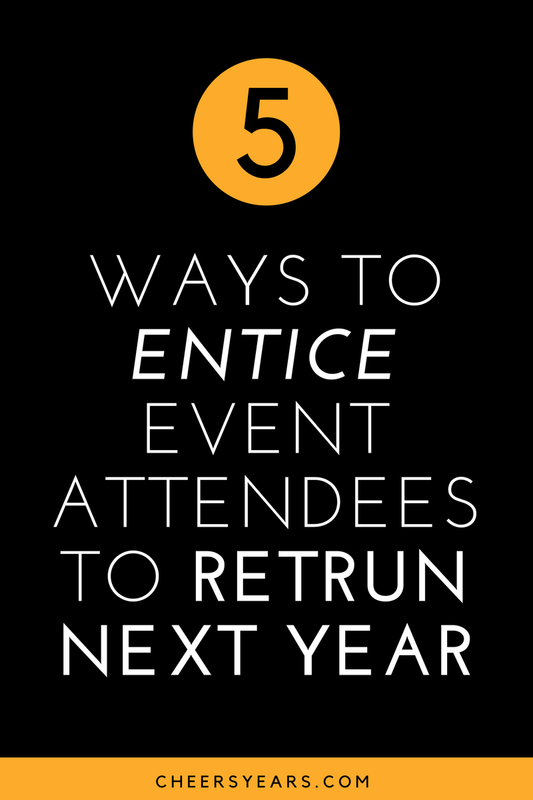 Specifically, I’m highlighted five ways to entice event attendees to return. 1. OFFER A KILLER SWAG BAG TAKEAWAY. If you don’t have a swag bag to gift attendees at the end of the event, I would highly advise adding one. Swag bags leave an excellent impression on attendees because they’re filled with items that people will remember from attending YOUR specific event long after it’s over. They also entice people to participate the full length of an event to receive their goodies upon the conclusion. I personally find this kind of humorous. It’s sort of like bribing a kid to be good and sit through an entire class and they’ll get a toy or candy at the end. Well, folks, not much has changed in adult-land. I actually know people that sign up to attend conferences and events exclusively for the goodie bag takeaway at the end. Now, that’s certainly not the real reason we want them to be interested, or stay for the duration of the event. However, it’s a great way to get attendee’s attention and keeping it until the next event. The physical swag bag that holds the goodies is an excellent opportunity for sponsorship. A sponsor’s logo can receive maximum visibility of everyone that takes home a swag bag. I still to this day use several logo bags for groceries, lunch carrier, and a gym clothes that where all swag bag giveaways from various conferences. Once you have a swag bag sponsor, it’s important to ask participating sponsors and/or exhibitors to bring swag to put into the swag bag. A lot of participating sponsors and exhibitors will want to give out fun things at their designated booth or area, but encourage them to either give all their swag for the goodie takeaway at the end or have a smaller item at their station and something larger for attendees to take home. 2. MAKE THEM FEEL APPRECIATED. If you’re giving attendees a swag bag at the end of the event, they’ll already leave with feelings of appreciation. Keep that gratitude momentum going by sending a follow-up email to all participating attendees thanking them for coming. It’s important to be authentic in the message and say something beyond the “thanks for coming and hope to see you next year”. Dig down deep and put consideration into what their attendance meant to your organization by coming, and relay that. This is also a great time to communicate any important metrics collected that would entice attendees to attend next year. An example would be “ninety percent of recorded attendees received (insert a fact here) from attending this year’s event”. Of course, you would want to have someone or some way to collect those facts onsite so that you’re relaying honest information. This is a great element to plan into the event, because that information can be a real attention grabber for your next event. When me and my committee chair were giving out goodie bags at the end of an industry trade show, I asked attendees if they enjoyed the event and what they found valuable about attending. I was able to collect a lot of great feedback from them right then and there at the conclusion of the event. I’ll use that information to make next year’s event even better. Plus, I was able to jot down a few testimonial quotes of attendees who had a great experience. I can use those positive quotes to include in the marketing for next year’s event. You can do this as well! If you’re giving away swag bags, it’s a great opportunity to first: smile and say, “thanks so much for coming” in person and secondly: ask if they had a good experience and what they valued. This will help you personally feel great about executing the event. Also, if you run into an attendee that had a negative experience, it gives you the opportunity to dig down and uncover why, then figure out how it can be avoided or improved next time. 3. SHARE SOMETHING THEY CAN LOOK FORWARD TO. Along with sharing the facts, quotes, and highlights of the event that just happened with an event recap (including great photos), it’s important to start getting people excited about the next event. Sharing details like the next destination, venue, speaker, etc. are a great way to get people excited to attend next year. A fun way to do this is by using social media or email newsletter blast to create a build up around unveiling various elements about the next event. For example, you could start a social media campaign giving clues to the next destination or speaker for a few weeks leading up to the reveal. This is a great way to get people curious and excited. 4. TALK TO THEM EARLY. In fact, never stop the conversation between the time they leave the conclusion of the immediate past event and the next one. Set reminders to send some type of update or communication for the next year’s event at least once a quarter. Even if you don’t have any new updates to share, send holiday greetings or “looking forward to seeing you next year” e-cards with your logo. You want potential attendees to know that you’re working on creating another great experience for them again. 5. SPOTLIGHT SPONSORS AND EXHIBITORS. When you’re communicating with attendees, put the spotlight on sponsors and exhibitors that participated in the past event as well as highlight those that will be participating again next year. This helps attendees remember the sponsors and exhibitors that were there and look forward to new ones they may have never seen before. It’s also a good reminder of what type of exhibitors and sponsors they can expect to be a part of your specific type of event. An added bonus about doing this is that it will make your past and future sponsors and exhibitors happy as well. They’ll love the extra coverage and will be even more likely to participate at the next event. If you’re hoping to maintain or increase attendance to your repeating event, think about these five ways to make attendees feel appreciated, and coming back again. I know both for both my future association and professional events, I’m putting these things into practice to get attendees excited about our next stellar event! If you attend a reoccurring event every year, what get’s you excited and interested to attend the next one? Comment below and let me know! **All photos in this post of this year's MPI-Carolinas Chapter Business Exchange are captured by IWP Photography.